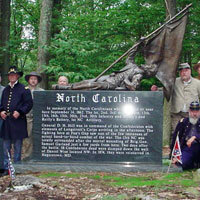 The members of the 13th North Carolina Troops Co B, spear headed the erection of a monument to the North Carolina Troops who fought at the battle of South Mountain Maryland. 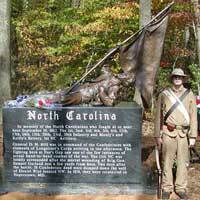 In memory of the North Carolinians that fought at or near here September 14,1862. The lst, 2nd, 3rd, 4th, 5th, 6th, 12th, 13th, 14th, 15th, 20th, 23rd, & 30th NC Infantry Regiments and the 1st NC Artillery, Manly and Reilly Batteries. General D H Hill was in command of the 10,000 Confederates with elements of Longstreets' Corps arriving in the afternoon. The fighting here at Fox's Gap saw one of the few instances of actual hand-to-hand combat of the war. 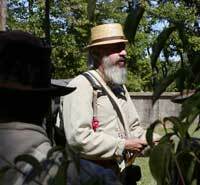 The 13th was totally surrounded after the mortal wounding of Brig Gen. Samuel Garland just a few yards from here. 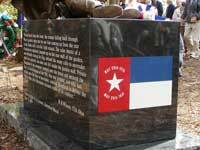 Two days after the battle, 58 Confederate dead were dumped down the well of farmer Daniel Wise located NW. In 1874, they were re-interred in Hagerstown, Md. "Driven back from the front, the enemy falling back through Wise's garden, were met by our line coming up from the rear in the flank, and a terrific fight ensued. The color bearer of a Confederate Regiment jumped up on the rear wall of the garden, and defiantly waving his flag refused the many calls to surrender which he received, was shot and fell inside the garden wall. Private Hoagland of my company jumped over the fence and secured the flag. Lt. Col. Coleman of the 11th, who was present and had called upon the man to surrender, ordered Hoagland to deliver the flag to him, and afterwards claimed credit of its capture." The above describes the fierce fighting in and around Wise's field probably during the afternoon action with Drayton's Brigade. Several Confederate color bearers were killed or wounded during the fight at Fox's Gap.